Sean Patrick Duffy (born October 3, 1971) is an American politician, prosecutor, former sports commentator and reality television personality. He first entered public life as a cast member on The Real World: Boston, 1998's Road Rules: All Stars, and 2002's Real World/Road Rules Challenge: Battle of the Seasons, before going on to serve as district attorney of Ashland County, Wisconsin, and the U.S. Representative for Wisconsin's 7th congressional district. He is a member of the Republican Party and supported Donald Trump's 2016 presidential bid. Duffy was born on October 3, 1971, in Hayward, Wisconsin, the tenth of 11 children of Carol Ann (née Yackel) and Thomas Walter Duffy. Duffy has a marketing degree from St. Mary's University, and a J.D. degree from William Mitchell College of Law. Duffy started log rolling at age five and speed climbing (sprinting up 60 and 90 foot poles) at 13. He holds two speed-climbing titles. Duffy has been an ESPN color commentator for televised competitions and in 2003 appeared as both a competitor and commentator on ESPN's Great Outdoor Games. He was named Badger State Games Honorary Athlete of the 2004 Winter Games. In 1997, Duffy appeared on The Real World: Boston, the sixth season of the MTV reality television show, and on Road Rules: All Stars in 1998, where he met his future wife Rachel. Duffy later appeared on Real World/Road Rules Challenge: Battle of the Seasons, which aired in 2002. Both appeared in a filmed segment on 2008's The Real World Awards Bash, while Duffy served as district attorney. Duffy, a Republican, was appointed to the district attorney's post in 2002 by then Governor Scott McCallum, and was elected unopposed in 2002, 2004, 2006 and 2008. Upon assuming the office of district attorney, he succeeded Michael Gableman, a current justice on the Wisconsin Supreme Court. Duffy was on the Republican slate of the 10 Wisconsin electors for the 2008 presidential election. On July 8, 2009, Duffy announced his campaign for Congress in Wisconsin's seventh congressional district. Duffy was considered an underdog in the race until May 2010 when 15-term incumbent Democratic Representative Dave Obey announced that he would not seek re-election. Following Obey's announcement, Democratic State Senator Julie Lassa joined the race. On June 4, 2010, Duffy announced his resignation from the position of District Attorney of Ashland County to focus on the congressional race. The resignation was effective three weeks later and Duffy returned to work in his father's law practice. He won the race on November 2, 2010, in a nationwide wave of Republicans being elected to Congress. Different sources attribute his victory to his ten-month head start on Lassa's campaign, his grassroots organization and fundraising, his experience as a district attorney, and voter discontent with the economy. Duffy was challenged by Democratic nominee Pat Kreitlow. Duffy was challenged by Democratic nominee Kelly Westlund. In 2011 Duffy voted to eliminate Davis-Bacon Act prevailing wage requirements for federal projects. The first piece of legislation he sponsored was the 2011 Recovering Excessive Stimulus Expenditures for Taxpayers (RESET) Act, which called for using unspent money in Obama's economic stimulus plan to pay down the federal budget deficit. The idea was later incorporated into a spending bill. He also introduced a resolution to ban earmarks. In March 2011, Duffy was criticized when a video published by the Polk County Republicans, showing a public town hall-style meeting in his district, was picked up by media commentators. In the video, made in the wake of the passage of a controversial state bill which would have effectively frozen the salaries of state employees, Duffy was asked about whether he would be willing to cut his own $174,000 salary. Duffy responded that he would only be willing to do so as part of a general round of salary cuts for government employees, and insisted that he was "struggling" to get by, despite his salary being nearly three times the average for Wisconsin residents. On December 22, 2011, Duffy and fellow GOP House freshman Rick Crawford (Arkansas), published an open letter to Speaker Boehner, urging the leader to allow the House to vote on the Senate's two-month tax cut extension compromise. In 2013, Duffy and Democratic House member Michael Michaud (Maine) introduced a resolution calling for government action to ensure that people be provided with paper-based information along with electronic. In October 2015, Duffy was named to serve on the Select Investigative Panel on Planned Parenthood. Duffy supported President Donald Trump's 2017 executive order to impose a temporary ban on entry to the U.S. to citizens of seven Muslim-majority countries. He stated that "President Trump is fulfilling a campaign promise to re-evaluate our visa vetting process so that the American people are safe from terrorism." In January 2017, Duffy co-sponsored legislation that would end protection for grey wolves in the Endangered Species Act. In July 2018, Duffy said that Europe, China, Canada and Mexico had committed "economic terrorism in a way" by placing retaliatory tariffs on the United States in response to tariffs enacted by the Trump administration. The bill is intended to increase the liquidity on the stock market of stocks belonging to emerging growth companies. It would allow small companies to choose a tick size of $0.05 or $0.10 instead of the standard $0.01. To participate, companies would need to have stock prices of over $1.00 and revenues of less than $750 million. On September 26, 2013, Duffy introduced the Consumer Financial Protection Safety and Soundness Improvement Act of 2013 (H.R. 3193; 113th Congress), originally named the Bureau of Consumer Financial Protection Accountability Act of 2013, also known as the Consumer Financial Freedom and Washington Accountability Act. It proposed replacing the director of the consumer watchdog group, the Consumer Financial Protection Bureau (CFPB), with a five-person commission and removing the CFPB from Federal Reserve System oversight so that it "would go through the same funding process as other federal agencies." The Consumer Financial Protection Bureau would have been renamed the Financial Product Safety Commission. The bill also intended to make overturning the decisions about regulations that the new commission made easier to do. The bill gave the commission more room to get rid of policies that Duffy believes jeopardize the safety of the US banking system. He was a cosponsor of the Financial Product Safety Commission Act of 2015 and has introduced a number of bills intended to weaken the CFPB. In December 2015, Duffy introduced the Puerto Rico Financial Stability and Debt Restructuring Choice Act (H.R. 4199) (developed into the Puerto Rico Oversight, Management and Economic Stability Act (PROMESA) (H.R. 4900) in 2016), which addressed the Puerto Rican government-debt crisis. The bill would create a short-term independent board to oversee Puerto Rico's financial planning and annual budgets, with the aim of restoring financial stability to Puerto Rico and avoiding American taxpayer liability. It is similar to bills written in July and October 2015 by Pedro Pierluisi, the Resident Commissioner of Puerto Rico, in that the Duffy bill also proposes a financial oversight board and access to Chapter 9 restructuring. The October 2015 Pierluisi bill was neglected in the U.S. Congress until the governor of Puerto Rico visited Washington on December 9, 2015, to draw attention to the crisis and the bill. "By the afternoon, Republicans in Congress had introduced two bills to help alleviate Puerto Rico's fiscal problems", one of which was the Duffy bill. In April 2016 the bill stalled in the House for rewriting. Duffy is a member of the Republican Main Street Partnership. Duffy is married to Rachel Campos-Duffy, a fellow alumna of The Real World: San Francisco and later Fox News Channel personality. They once lived in Ashland, Wisconsin. They moved to Weston, a suburb of Wausau, Wisconsin, in late 2011, and in 2013 they moved to Wausau. They have eight children: Evita Pilar, Xavier Jack, Lucia-Belen, John-Paul, Paloma Pilar, MariaVictoria Margarita, Margarita Pilar, and Patrick Miguel. Duffy is a practicing Roman Catholic. ^ Lim, Naomi (August 24, 2016). "Trump ally: I'm not peddling 'conspiracy theories' about Clinton's health". CNN. Retrieved August 26, 2016. ^ "Rep. Sean Patrick Duffy". LegiStorm. Retrieved March 6, 2014. ^ "Wisconsin: Sean Patrick Duffy" Archived 2014-03-06 at Archive.today. The Washington Times. Retrieved March 5, 2014. ^ "Sean Duffy's Biography". Project Vote Smart. Accessed November 3, 2010. ^ a b "Hayward Lumberjack Champion Sean Duffy Named Honorary Athlete | Sports in Wisconsin". Badgerstategames.org. July 17, 2007. Archived from the original on October 19, 2009. Retrieved April 7, 2010. ^ "Lumberjack World Championships, Hayward". Classic Wisconsin. Archived from the original on July 28, 2012. Retrieved April 7, 2010. ^ "The Real World Awards Bash (Extended Version)". MTV. accessed April 5, 2011. ^ "Real World: Washington – The Scorecard". Politico.Com. Retrieved April 7, 2010. ^ a b "Bloomer passes referendum on first try". Chippewa.com. February 19, 2003. Retrieved April 7, 2010. ^ "Wisconsin State Elections Board Results of Fall General Election – 11/02/2004" Archived 2011-07-18 at the Wayback Machine, December 1, 2004, accessed January 2, 2011. ^ "Wisconsin State Elections Board Results of Fall General Election – 11/07/2006" Archived 2008-04-30 at the Wayback Machine, December 5, 2006, accessed January 2, 2011. ^ Marrero, Diana (October 30, 2008). "Wisconsin slate of potential electors cut from all cloths". JSOnline. Retrieved April 7, 2010. ^ "Sean Duffy running for congress". WAOW. July 8, 2009. Retrieved April 7, 2010. ^ "Wisconsin's Duffy says he's ready to get to work" Archived 2010-11-08 at the Wayback Machine. Chicago Tribune/Associated Press. November 3, 2010. ^ "Strong campaign, voter discontent keys to Duffy victory" Archived 2011-07-18 at the Wayback Machine. News Talk 550AM 99.9AM WSAU (AM). November 4, 2010. Retrieved November 14, 2010. ^ "Republican Representative Sean Duffy of Wisconsin". That's My Congress. Retrieved March 5, 2014. ^ "Sean Duffy on Jobs", ontheissues.org; retrieved March 5, 2014. ^ Bivins, Larry (December 24, 2011). "Duffy ends 2011 with bill he promised at start". The Marshfield News-Herald. ^ Stewart, Rebecca. "'Real World' congressman's money troubles", CNN, March 30, 2011. ^ Gilbert, Craig. "House freshman Duffy tells constituents "he's not living high on the hog" on congressional pay", Milwaukee Journal Sentinel, March 29, 2011. ^ Downie, James. "How to Prolong a Scandal, Wisconsin Edition", The New Republic, March 31, 2011. ^ Bivins, Larry. "Dems mock Sean Duffy's $174,000 salary 'struggles'", Wausau Daily Herald, March 31, 2011. ^ "Payroll tax cut: Two GOP frosh bail, push for two-month bill". Politico.com, December 22, 2001. ^ Rein, Lisa (February 16, 2013). "Group tries to slow federal government’s move away from paper to the Web". Washington Post. ^ "Republican-controlled government sees chance to weaken Endangered Species Act". Ars Technica. Retrieved March 11, 2017. ^ "Republican congressman accuses Canada of 'economic terrorism' | The Star". thestar.com. Retrieved July 31, 2018. ^ a b Cooley, Tracy (December 4, 2013). "Emerging Company Policy Deconstructed: Small Cap Liquidity Reform Act (H.R. 3448)". Bio Tech Now. Retrieved February 10, 2014. ^ "H.R. 3448 – Summary". United States Congress. Retrieved February 10, 2014. ^ a b "H.R. 3192 (113th): Bureau of Consumer Financial Protection Accountability Act of 2013". September 26, 2013. Retrieved April 19, 2016. ^ "H.R. 3193 – Summary". United States Congress. Retrieved February 11, 2014. ^ a b Kasperowicz, Pete (April 17, 2018). "House to take another swing at Dodd-Frank reform". The Hill. Retrieved February 11, 2014. ^ "House Members Introduce Bills Targeting CFPB Practices and Oversight". Bank-Insurance Connection.com. American Bankers Association. September 30, 2013. Retrieved April 19, 2016. ^ "Congress to hear impact of regulations in Wausau", wsau.com, October 31, 2011. ^ "Duffy Reintroduces CFPB Reform Package". March 5, 2015. Retrieved April 19, 2016. ^ "SPECIAL REPORT: Republican Attacks on the Consumer Financial Protection Bureau" (PDF). Democratic Policy & Communications Center. July 22, 2015. Retrieved April 19, 2016. ^ "Duffy Bill Addresses Puerto Rico Debt Crisis; Shields Americans from a Taxpayer Bailout". December 9, 2015. Retrieved April 19, 2016. ^ "H.R. 4900" (PDF). April 12, 2016. Retrieved April 19, 2016. ^ "Pierluisi Introduces Legislation Authorizing U.S. Treasury Department to Guarantee Future Puerto Rico Bonds". October 8, 2015. Archived from the original on May 5, 2016. Retrieved April 19, 2016. ^ "U.S. Senators Introduce Identical Companion Bill to H.R. 870, the Puerto Rico Chapter 9 Uniformity Act". July 15, 2015. Archived from the original on April 17, 2016. Retrieved April 19, 2016. ^ Planas, Roque (December 9, 2015). "Puerto Rican Officials Say Congress' Inaction Will Lead To 'Humanitarian Crisis' On The Island". Huffington Post. Retrieved April 19, 2016. ^ Planas, Roque (December 10, 2015). "Puerto Rico's Member Of Congress Is So Frustrated, He'd Prefer Independence". Huffington Post. Retrieved April 19, 2016. ^ House, Billy; Kaske, Michelle (April 13, 2016). "Puerto Rico Bill Stalls in House Amid Objections by Both Parties". Bloomberg.com. Retrieved April 19, 2016. ^ Hertel, Nora (November 20, 2014). "Duffy tapped for leadership position in House". Wausau Daily Herald. Retrieved April 28, 2016. ^ "Rep. Sean P. Duffy wins Wisconsin's 7th Congressional District seat". The Washington Post. November 8, 2018. ^ "Sean Duffy for Congress". Duffyforcongress.com. Retrieved April 7, 2010. ^ Sean Duffy (April 5, 2010). "Welcome MariaVictoria Duffy!". duffyforcongress.com. Archived from the original on October 1, 2010. Retrieved April 11, 2010. ^ Campos-Duffy, Rachel. "I'm Expecting My 5th: What To Make Of The Trend In Bigger Families", Parent Dish, December 19, 2007. ^ "Reality Couples: Rachel Campos". Latina. Retrieved December 7, 2012. ^ "Cast and Crew". The Wedding Video. Retrieved December 7, 2012. ^ Olivo, Rick (October 19, 2011). "Mr. Duffy moves to Weston". HaywardWI.com. ^ "Rachel Campos-Duffy Welcomes Daughter MariaVictoria Margarita", People magazine; April 16, 2010 "Sean and Rachel Campos-Duffy welcome fifth child, daughter Paloma Pilar". People. May 20, 2008. ^ "OnPolitics - USA TODAY's politics blog". USA TODAY. Retrieved April 17, 2018. 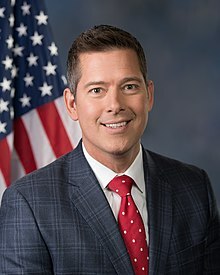 Wikimedia Commons has media related to Sean Duffy. This page was last edited on 27 March 2019, at 05:35 (UTC).